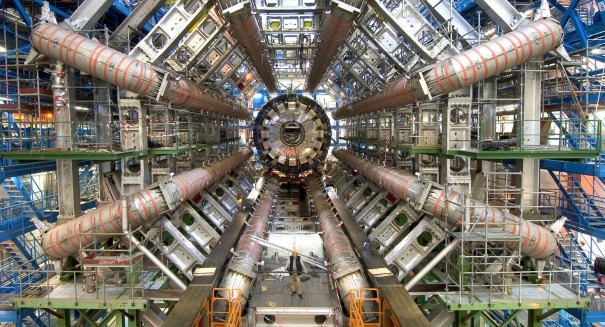 The Large Hadron Collider is expanding our knowledge of physics. New results from the Large Hadron Collider in Switzerland indicate that we could be making a major breakthrough in the world of physics sooner rather than later — and for the first time, you can get a detailed view of what this amazing laboratory looks like. Scientists are currently working with the “standard model” of physics, but it doesn’t explain a lot of things out there in the universe, and that’s where the LHC comes in: helping mankind explore the very fundamentals of physics as we know it, according to a statement from the Henryk Niewodniczanski Institute of Nuclear Physics Polish Academy of Sciences. Now, you can watch a video of the LHC’s YouTube app on your smartphone or tablet, and control the view, tilting or shifting to see the amazing machine at the heart of some of the most breathtaking discoveries of physics, in recent years and in the years to come. After taking a break, the LHC is back in action, colliding protons at higher energy levels to help scientists further break down the mysteries of the universe. The LHC has already helped scientists find the elusive Higgs boson — and now it’s charged with making forays into the mysterious world of dark matter. “Up to now all measurements match the predictions of the Standard Model. However, we know that the Standard Model cannot explain all the features of the Universe. It doesn’t predict the masses of particles or tell us why fermions are organized in three families. How did the dominance of matter over antimatter in the universe come about? What is dark matter? Those questions remain unanswered. What’s more, the force we all experience every day, gravity, isn’t even included in the model,” Prof. Mariusz Witek said in the statement.